This Nokia C3 review offers a broad overview of the Nokia C3 mobile phone, launched as a companion to the Nokia C5. While the Nokia E series targets the business community, the Nokia C series targets individuals looking for a budget handset with good communication features. In the C3, the QWERTY keyboard built into the front of the handset; Ovi Chat and Ovi Maps provide higher than average communication options. The Nokia C3 is available in slate grey, gold, white and hot pink colour options. The slate grey is blue rather than grey, but a nice shade for a phone. The shell of the phone has a shiny finish and prone to attracting greasy fingerprints. The back of the phone is a matt finish that is not so attractive to fingerprints and also enhances the grip on the phone. 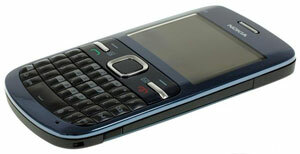 The Nokia C3 mobile phone comes equipped with a mini QWERTY keyboard and a decent set of tools for communication. The phone has standard SMS – threaded conversation mode, Facebook and Twitter integration with pre-installed home-screen widget and email supporting IMAP and POP3 accounts. For anyone requiring instant messaging of a higher level, the phone offers Ovi Chat to connect to several IM clients using Yahoo and Windows Live. The C3 allows users to access to the Ovi store to download new applications when required. Nokia has included Wi-Fi to compensate for the lack of 3G, so downloading apps is not a problem. However, the missing 3G technology means users cannot stay connected when travelling on buses and trains. Even with the Wi-Fi technology present, all downloading needs to be completed before leaving the Wi-Fi network. The phone also has Soft menu buttons, Call and End buttons with the end button also performing as the on/ off switch. The Nokia C3 camera is 2 mega-pixels, but no flash. Apparently the absence of flash and autofocus is part of the standard configurations for similarly priced phones. However, there is an upside because the camera takes pictures at a fairly good clip; less than half a second for each picture taken. Here’s a tip for gamers, access the Ovi store and download Nokia sponsored games. There are approximately a dozen titles. Electronic Arts have developed such as Sims and Bejewelled. Pros include the excellent mini QWERTY keyboard; good Twitter and Facebook integration delivered to the main screen; Wi-Fi and a jack that is top mounted. Cons include lack of 3G technology; poor viewing angle regardless of the large screen; camera does not have a flash and is not very effective. The Nokia C3 mobile phone is available from Nokia directly at £119; it can be purchased at some retail outlets for just £80 with a free SIM card thrown in. If you compare C3 deals using Mobilesplease, you can currently pick up a free Nokia C3 with 300 minutes, unlimited texts on Vodafone for £20 a month. If you buy through e2save, they’ll even throw in a 4GB XBox 360! It is hard to find too much fault with the phone and Nokia has as always done a great job. The Nokia C3 does its duty and performs well as a phone and messaging instrument. Users will find it is a great option for a budget phone provided too much is not expected out of it.